Before moving into in-depth review and comparison between Zinus Vs Tuft and Needle, there is one significant factor that has to be highlighted well in advance. The price difference between the two is rather huge; Tuft and Needle costs more than double the price of Zinus mattress. And Zinus cost-wise is equal to all budget mattresses. The biggest USP of Zinus mattress is its both anti-bacterial and odor free. Thanks to green tea extract and natural plant oil infused into the mattress. In budget mattresses segment, it is best advised to choose Zinus as it offers additional benefits at same price of regular memory foam mattress. Zinus has employed a 3 layer construction wherein the top layer is made of 2.5 inch memory foam followed by a 2 inch comfort foam layer. The base layer is 5.5 inch high density foam. The top two layers are infused with both green tea extract, natural plant oil and active charcoal. Green tea extract makes the mattress anti-bacterial in nature while active charcoal and natural plant oil keeps it free from unpleasant odors. Tuft and Needle has a simple two layer construction. The top layer which is proprietary is 3 inches thick and the base high density supportive layer is 7 inches thick. Most other mattresses, including Zinus, have a 3 layer construction wherein the top two layers are made of memory foam and comfort foam respectively. The indentation (firmness) increases with every layer, the topmost layer is plush, intermediary layers are medium plush and medium firm whereas the base layer is firm as it’s made of high density foam. But the biggest advantage with Tuft and Needle is that it has developed its own proprietary foam that is neither too plush nor too firm. It carries the properties of both the latex foam as well as visco-elastic foam. It offers right amount of bounce very much like latex foam and also includes much important support of visco-elastic foam. On a scale of 1 to 10, the firmness of Zinus green tea mattress stands at 6 whereas the firmness of Tuft and Needle mattress stands at 6.5. The universally accepted firmness stands between 6 and 6.5. 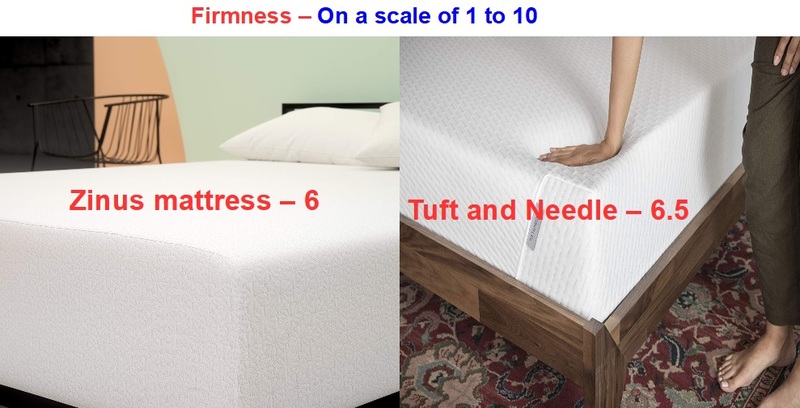 One commonality in mattresses that sell in huge numbers is that they stick to this very firmness range. Very few mattresses are built to be too plush or too firm as their market share is significantly low. Motion isolation is a key factor especially when you are sharing your bed with your partner. The proprietary foam in Tuft and Needle sinks at the maximum by no more than 3 inches. After which there is this 7 inch thick HD layer that absolutely holds your body weight and avoids from sinking further. Hence, the radius of impact is also around 3 to 4 inches which is relatively within mandatory limits. Zinus green tea mattress with a combined 4.5 inch thickness of top two layers sinks at the maximum by 4 inches. The radius of impact too is within 5 inches which is again a very good score. Both Zinus and Tuft and Needle perform more or less the same on motion transfer parameters and pose absolutely no problems at all. Edge support is an important parameter but it’s not too mandatory either. No memory foam mattress offers 100% edge support. When you call it memory foam, it means it has the tendency to be plush on the sides. And how plush it is, is what matters the most. Tuft and Needle owing to 7 inch base high density layer offers better edge support than Zinus that has 5.5 inch thick HD layer.. Odor is a common problem with all memory foam mattresses. The reason being that these foams are compressed and shipped and the moment you open the mattress, it releases the brand new mattress smell as it inflates. Anyways, it is always advised to leave the mattress for at least two to three days so that the smell disappears fully. Another important point is that never test the mattress when it is inflation. Do not press the mattress with your hand or try to sit or sleep on it. Although all mattresses expand to their full size within few hours from opening but it is always mandatory to leave them for 48 to 72 hours so that they inflate in every nook and corner and also the smell disappears fully. Both Zinus and Tuft & Needle are shipped bed in box making it easy to carry inside home. While both Zinus green tea mattress and Tuft and Needle come with 10 year warranty, the biggest advantage with Tuft and Needle is that it again offers 100 night sleep trial period. Tuft and Needle justifies its price with the trial period offer. Although it is pricey but you have the trial period to test whether it suits your sleeping needs. In case, you wish to return for any reason post the trial period, then Tuft and Needle will collect the mattress from your doorstep. However, such a scenario is rather rare in its case. Perhaps, its because of the tremendous R&D and tedious testing process it ran on its prototypes before launching THE PERFECT mattress into the market. The conclusion stands simple, if you have the budget then I would suggest you to enjoy the comfort of sleeping on a luxurious premium mattress by opting for Tuft and Needle. The proprietary foam is a bet as it is a mix of both latex and visco-elastic foams. 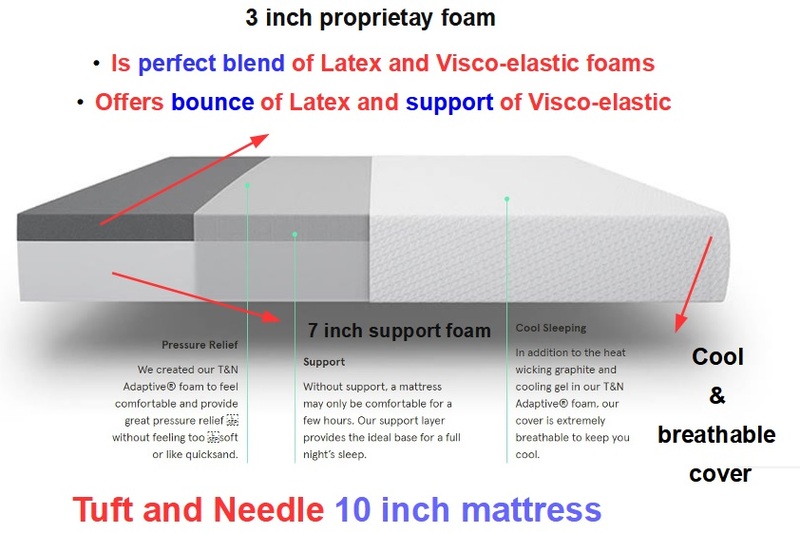 It carries the bounce of a latex mattress and the support of a visco-elastic mattress. Most recommended for those who are having chronic back pain issues. Else, if you are looking for a decent mattress but need something special to come at an affordable price then choose Zinus Green Tea Mattress. It comes at the same price like all memory foam mattress but has several added benefits to it. The green tea extract is anti-bacterial in nature and keeps the sleeping surface hygienic for several years. Additionally, natural plant oil and activcharcoal get rid of unpleasant odors emanating from sweat and other fluids that accumulate within the foams over a period of time.